The Marshall CODE50 should be a fantastic amp for a number of applications. They have used Softube MST technology to model classic and modern valve tones. These are of the highest quality yet remain affordable. Jump straight in and explore 100 presets, the CODE50. No extension cabinet outputs, 1 x 3.5mm jack headphone out. Speaker model. CREATE YOUR SOUND. TM has all you need to start performing and recording with. Jump straight in and explore 100 presets, the Marshall CODE50 has all you need to start performing and recording with. 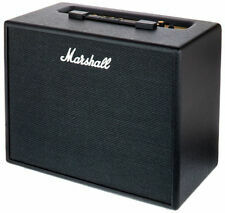 Speaker model: Custom (4Ω, 50w). Connect via USB to use CODE as a DAW interface to record, and to stream audio from your computer. The specialised preamp, power amp and speaker cabinet models have been developed in collaboration with Softube. It has 24 FX including: Compressor, classic stompbox Distortions, Auto Wah, Pitch Shifter, Chorus, Phaser, Flanger and Tremolo. 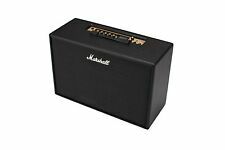 Marshall Code 50 Modeling Guitar Amplifier Combo at a Glance Marshall Code 50 Modeling Guitar Amplifier Combo Features Re-creates decades of classic Marshall preamp/power amp/speaker cab combinations. 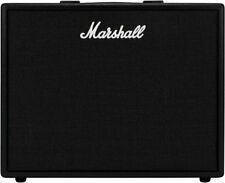 Marshall Code 50W 1x12 Digital Combo Features It has 24 FX including Compressor, classic stompbox Distortions, Auto Wah, Pitch Shifter, Chorus, Phaser, Flanger and Tremolo. It includes Delays with Tap Tempo, and studio quality Reverbs. 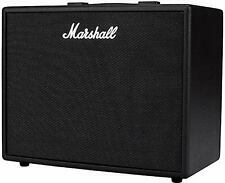 Marshall Code 50W 1x12 Digital Combo. It has 24 FX including Compressor, classic stompbox Distortions, Auto Wah, Pitch Shifter, Chorus, Phaser, Flanger and Tremolo. It includes Delays with Tap Tempo, and studio quality Reverbs.